The specter of West Nile Virus has put mosquitoes “front and center” in the pest management industry. Public awareness of mosquitoes is at an all-time high, and customers are asking what — if anything — can be done to lessen the risk of being bitten. In response, a growing number of pest control firms have begun offering mosquito management services to their residential clients. The heart of this service is the application of residual pyrethroid sprays to the daytime resting sites of adult mosquitoes. Mosquito larvae live in water, but the biting adults spend most of the daylight hours residing in dense vegetation and shade before searching for an evenings’ blood meal. KNOW YOUR ENEMY. To most people, all mosquitoes are pretty much the same and considered a single entity. In fact, there are about 2,500 species of mosquitoes in the world and about 150 different species in North America. Kentucky has about 50 different species, and on a typical summer’s evening in a suburban backyard, a half-dozen or so will be present. Each of these species has its own characteristics and requirements. They are distinct populations, and a particular management strategy may not be equally effective against them all. Fortunately, the most common mosquito species found near homes in North America fall within only a few important groups. One very important group from the standpoint of disease transmission is the genus Culex. Many of these mosquitoes preferentially feed on birds and spend most of their time high above the ground, typically in trees. Eggs are laid in rafts on the surface of water in old tires, birdbaths, roof gutters and similar “containers” which hold water. Culex mosquitoes are the primary vectors of West Nile virus and other diseases of greatest concern in this country. The most important Culex species differ by region: the northern house mosquito, Culex pipiens, dominates in the northern half of the continental United States; the southern house mosquito, Cx. quinquefasciatus, dominates in the southeastern U.S.; and Cx. tarsalis is the most important vector in the western U.S.
Another important group is the Aedes and Ochlerotatus mosquitoes. Many of these mosquitoes prefer to feed on mammals and spend most of their time in low-lying vegetation. Eggs are laid singly at the water’s edge, often in similar areas as Culex mosquitoes. This group includes the Asian tiger mosquito, Aedes albopictus (see photo above), which has become one of the most serious nuisance mosquitoes in North America. Besides being an annoyance, the mosquitoes in this group also transmit some important diseases, such as LaCrosse encephalitis, and are the primary vector for canine heartworm. Many other genera of mosquitoes can occur in residential settings. However, these two groups will account for the vast majority of mosquito bites that homeowners suffer throughout most of the United States. Consequently, both must be considered from the standpoint of mosquito management. THE STUDY. During the summer of 2004, a field study was undertaken to assess the effect of insecticide sprays on mosquitoes residing around suburban homes. We wanted to know if pyrethroids, applied to adult resting sites, actually reduced mosquito populations and the incidence of bites to people using their yards. We also surveyed householder attitudes toward mosquitoes, if they thought the treatments were effective, and their willingness to pay for such services. Treatment Method. Twenty-four single-family residences were selected from eight suburban neighborhoods in Lexington, Ky. Each home was on a 1⁄4- to 1- acre lot with similar types and density of plant material. Houses with an abundance of shade and vegetation were chosen to increase the likelihood of finding mosquitoes. Homes selected within each neighborhood were randomly assigned one of the following three treatments: 1) TalstarOne™ (bifenthrin) applied at 1.0 ounces per gallon water (0.06% suspension), 2) Demand® CS (lambda-cyhalothrin) applied at 0.8 ounces per gallon water (0.06% suspension), and 3) water alone. These were the maximum label rates for both pyrethroid products. Each treatment was applied to eight houses as a single (one-time) spray application. Treatments were provided free of charge to homeowners willing to participate in the study, but they were not told beforehand which treatment they received — including those whose yards were treated only with water. Treatments were applied June 16-18, 2004, by a local pest control firm working under our supervision, and all applications were performed by the same individual. 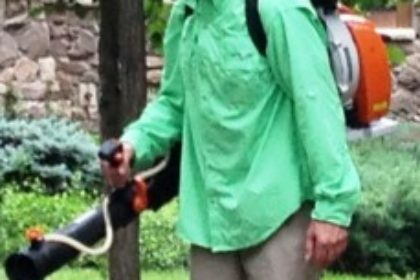 Treatments were applied with a backpack mistblower (Stihl, model SR420), operated at full throttle with a nozzle setting of “3” and the nozzle tip held about 2 to 4 feet from foliage or other daytime resting sites of adult mosquitoes (see photos on pages 44 and 52). Treatments were applied to upper and lower surfaces of foliage (shrubs, lowermost tree limbs, ground cover such as ivy, etc.) around the perimeter of each house and yard. Turf areas were not treated since these are not considered important resting sites of adult mosquitoes. Undersides of decks and similar damp, shady areas were treated as well. Overall, an average of 6.4 gallons of spray was applied to each property, ranging from 1.3 to 13.7 gallons, depending on amount of foliage/lot size. Efforts were made to achieve thorough coverage of all likely daytime resting sites of adult mosquitoes. Care was taken to minimize spray drift into neighboring yards, and no attempt was made to propel the mist high up into tree canopies other than the lowermost limbs (e.g., 8 to 10 feet above ground level). Monitoring Methods. Three types of standard traps, as well as human landing rate counts, were used to monitor mosquito populations at each home. A CDC miniature light trap (without the light) was baited with 5 pounds of dry ice pellets, which served as a carbon-dioxide (CO2) source. Removing the light ensured that the trap only collected mosquitoes that were seeking a blood meal and were attracted to the CO2. These traps were placed about 15 feet in from the perimeter edge of the property. A second trap type used was the CDC gravid trap containing water “spiked” with grass and rabbit food (a source of yeast), to emulate stagnant water in which species such as Culex prefer to lay their eggs. These traps were placed on the ground near the border foliage edge of the property. The third trap type, an egg trap (ovitrap), was designed to emulate a tree hole and attract several types of mosquitoes, particularly species like the eastern tree hole mosquito (Oc. triseriatus), and container-breeding mosquitoes like the Asian tiger mosquito. These traps consisted of a large coffee can painted flat black and lined with egg-laying paper. The cans containing a water-grass mixture were hung about 5 feet from the ground in a vegetated area. Eggs were collected from the traps and species were determined by rearing out larvae. Another useful — if somewhat unnerving — monitoring method involved taking mosquito landing rate counts on a human volunteer. During evenings between 6:00 and 10:00 p.m., the subject stood in an area of each yard where outdoor recreation presumably occurred, such as near a deck or garden. Pants were worn with holes cut in each leg, revealing about 80 in2 of exposed skin. Mosquitoes landing to take a blood meal were counted for 10 minutes per house, and collected for subsequent identification. Using the aforementioned methods, mosquitoes were monitored weekly at each property, beginning two weeks prior to treatment and continuing for eight weeks post-treatment. Light traps and gravid traps were placed on the properties between 6:00 and 10:00 p.m. and collected between 9:00 and 10:00 a.m. the following morning. Egg-laying traps were left out continuously and serviced weekly. The average number of mosquitoes collected each week per sampling method was statistically analyzed. Homeowner Survey. Participating homeowners were surveyed three times during the study period. Four weeks before treatment, households were polled regarding their knowledge and attitudes toward mosquitoes in general. Subsequent surveys were conducted three and seven weeks after treatment to assess their level of satisfaction, and what they thought such a service would be worth. RESULTS. Mosquito species from all three major genera — Culex, Aedes and Ochlerotatus — were abundant in yards sprayed with water alone. In comparison, both pyrethroid products (Demand® CS and TalstarOne™) significantly reduced total mosquito numbers in treated yards for up to six weeks. The products were similar in effectiveness, and levels of suppression were combined for purposes of this article. Although both pyrethroids reduced the overall mosquito population, they did not affect all mosquito species equally. Specifically, as shown on page 54, the Aedes and Ochlerotatus species were dramatically affected but Culex species were not. Within the first week following pyrethroid application, Aedes and Ochlerotatus species were reduced by 87%, compared with the water treatment. Even after four and six weeks, there was a cumulative reduction in the population by 72% and 61%, respectively. Various Aedes and Ochlerotatus species are responsible for most of the mosquito bites experienced by homeowners. In fact, all of the mosquitoes collected from the human landing rate samples were these mosquitoes, and 98% of them were Asian tiger mosquitoes. When we examined human landing rates separately from the trap catches we found that the number of bites was reduced by an even greater degree — 84%, 80% and 71% reduction in the number of bites over a period of one, four and six weeks, respectively. In contrast to the Aedes and Ochlerotatus mosquitoes, almost all (98%) of the Culex mosquitoes we collected were caught in gravid traps. The chart on page 54 clearly shows that the number of Culex caught in gravid traps after pyrethroids were applied did not differ from the number caught in yards sprayed with water alone. HOMEOWNER SURVEYS. In a pre-treatment attitudinal survey, nearly all (96%) of the homeowners in our study said they were bothered by mosquitoes, and more than three-fourths (77%) said that mosquitoes limited their backyard activities. Seventy-one percent believed mosquitoes in their yard posed a health threat as well as being a nuisance, while 84% indicated they would tolerate no more than two bites before taking some form of action. In terms of financial compensation, half (50%) of those who received a single pyrethroid treatment indicated they would be willing to pay for such a service on a recurring basis (e.g., monthly), whereas only 17% of those receiving water were willing to do so. Thirty-nine percent of the former group said they would be willing to pay $50 to $100 for a single treatment, whereas no one receiving the water treatment was willing to pay that much. STUDY IMPLICATIONS. Aedes and Ochlerotatus were the most abundant mosquitoes collected from CDC light traps and egg traps, and the Asian tiger mosquito (Ae. albopictus) was the most commonly observed mosquito during human landing rate counts. Both of these were strongly suppressed by the pyrethroids, so it is clear that Demand® CS or TalstarOne™ applied as a barrier treatment to ground foliage and lower canopy foliage are effective in reducing mosquito bites for up to six weeks after treatment. There was little difference in effectiveness between the two pyrethroids at application rates and treatment procedures used in this experiment. Furthermore, from other experiments that we performed in 2004, we believe that other leading pyrethroids are likely to be similarly effective against these two groups of mosquitoes when applied as barrier treatments. However, the fact that there was no significant effect on the Culex mosquitoes is troubling because these are the primary vectors of many important diseases, including those that most concern homeowners, such as West Nile virus. It is well known that Culex mosquitoes are about as susceptible to pyrethroids as are other mosquitoes; therefore, the lack of Culex control in our study was probably due to Culex mosquitoes not contacting the treated surfaces. There are several possible reasons for this. First, Culex mosquitoes may have different resting sites from the other mosquitoes. For example, because they prefer to feed on birds, their resting sites are higher in the tree canopy. Many of these properties had trees taller than 50 feet, but little spray was deposited above 15 feet. Additionally, there are some reports of Culex mosquitoes resting on structural surfaces, such as under house eves, which were not treated in this study. Perhaps if we would have applied the pyrethroid to tree canopies or possibly other surfaces, better Culex control might have been observed. Another possible reason for inadequate Culex control may come from the small spatial scale of a suburban backyard. Culex mosquitoes are weak fliers; They are unable to fly against even a small breeze. If they begin flight high off the ground in a tree canopy, they may be easily blown in from neighboring, untreated yards, without landing on vegetation within treated yards. If this is the case, then reliable backyard Culex control may not be attainable using this method, even if all of the vegetation is treated. This is important because while Culex mosquitoes cause only a small percentage of the mosquito bites that homeowners experience in their backyards, they are the primary vectors of diseases that most concern homeowners and public health professionals alike. That this control method, as tested here, may be less effective when used against Culex mosquitoes suggests that pest management professionals should refrain from emphasizing this technique as a disease risk-reduction strategy. Further research is needed to improve Culex control and to document disease risk reduction before such claims can be justified. On the positive side, however, our study clearly shows that this technique is highly effective at substantially reducing overall mosquito bites and that this reduction, in itself, satisfied the homeowner. It “gave them back their yards,” and homeowners were pleased enough with the result alone to be willing to pay for it. Our study confirmed that this effect was real (as opposed to a placebo effect) and scientifically significant, even given the large amount of variation between backyards. OPERATIONAL CONSIDERATIONS. 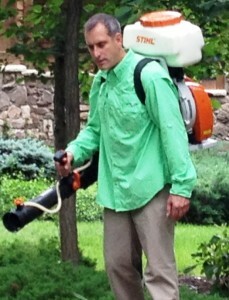 Many pest control firms are unfamiliar with mosquito spraying equipment. While conventional backpack sprayers or power spray rigs can be used to treat vegetation and other mosquito resting sites, such equipment can be less than ideal, especially when treating larger properties. Conventional backpack sprayers can be more tedious to use and generally do not provide the level of coverage afforded by a mistblower. Power spray rigs are effective for perimeter pest control but can be cumbersome when hauling treating hoses throughout yards. In some cases, truck-mounted hoses may not extend from the street or driveway to the rear of the property. Backpack mistblowers, such as the one used in this study, forcefully disperse small droplets of insecticide onto plant foliage and leaf undersurfaces and deep into dense vegetation where adult mosquitoes tend to hide. The portability of the unit enables applicators to treat anywhere on the property without having to haul a treating hose. The standard 3-gallon spray tank can often treat an entire property (and sometimes more) before having to be refilled. On the other hand, mistblowers do have limitations. Some technicians may find them a bit heavy to carry throughout the day (about 50 pounds when filled). Applicators using mistblowers must be vigilant about where the spray mist is drifting, so as not to contaminate play equipment, birdbaths, fishponds and other non-target areas. Care should be taken when treating property margins so as not to overspray neighboring yards, and whenever possible we should avoid spraying flowering plants that are frequented by bees and other beneficial pollinators. Technicians should also wear appropriate protective equipment, including long-sleeved pants and shirt, gloves, hat and eye protection, preferably a full-face shield. Some companies also use protective lotion (e.g., Gloves in a Bottle®), to help shield exposed skin from chemical exposure. When spraying upwind, overhead or into dense vegetation, it’s easy to expose oneself to the fine mist generated by the machine. Applicators can reduce their exposure by using a coarser spray droplet setting and treating densely vegetated areas while backing outward. More study is needed to determine just how thorough one must be to provide acceptable control of adult mosquitoes. In our study, an effort was made to achieve thorough coverage of mosquito resting sites; time spent treating yards averaged 21 minutes (range 5 to 45 minutes). It is possible that adequate protection could have been afforded with lower volumes of material applied in a somewhat less comprehensive fashion. Laboratory bioassays with other pyrethroids suggest that other products may perform as well as those in this study. However, some of these studies suggest that some products may perform better than others at lower volumes or application rates. Our study found no difference between the two pyrethroids applied at maximum label rates. Had we used a lower rate, differences may (or may not) have been found. Based on our findings, treatment of adult mosquito resting sites can be a useful component of an integrated pest management program in residential settings. Along with removing standing water, strategic larviciding and client education/personal protection, such treatments may be one of the most effective ways for homeowners to suppress nuisance mosquitoes and regain the use of their yards. Drs. Grayson Brown and Michael F. Potter are professors at the University of Kentucky. Dr. Jamee Hubbard is a research scientist and Rebecca Trout a graduate student at the same institution. Funding for the study was provided by FMC Corporation and Syngenta Professional Products. The authors thank All-Rite Pest Control, Lexington, Ky., for performing the treatments.